The locking lug area on most bolt action rifles has a tendency to collect brass chips from cases, brush bristles, primer residue, bolt lug grease, and solvents. This accumulation of debris can wear heavily on your bolt lugs. Our lug recess tool should be used routinely by every rifle owner to clean this neglected and hard to reach area. Lug Recess Tool - Specifically for cleaning the locking lug recess area. Use with felts or cotton rolls. Chamber Swab and Handle - For cleaning and drying the chamber. 8-32 threads for large bore mops. Bolt Brush - Double headed brush to scrub the bolt lugs, bolt face, and bolt body. The lug recess tool has a slotted head that accepts cleaning felts and cotton rolls (supplied with the tool). This tool is inserted into the action and rotated inside the lug recess areas. Solvent can be applied to the felts or cotton to remove debris. A dry felt or cotton roll can then be used to dry the area out. The chamber can then be wiped out with the swab handle and mop. The bolt should be sprayed down with a degreaser and scrubbed with the double-headed brush. Be sure to apply new grease to the bolt on the bearing surfaces of the bolt. The bolt shroud should also be routinely cleaned and re-greased. 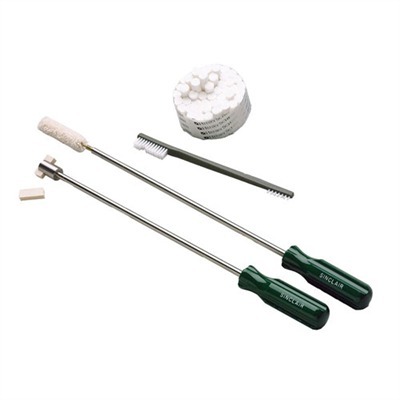 The Lug Recess Tool and Swab Handle are both made of stainless steel for a lifetime of use and can be purchased individually.